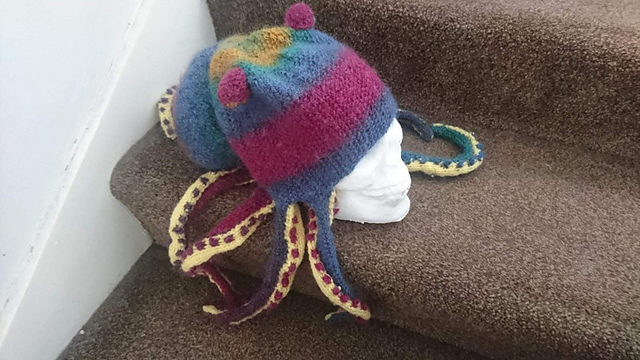 My sister wanted an octopus hat, so I created her one! Throughout the pattern you will have to increase and decrease the number of stitches. Try to increase/decrease in the K1P1 pattern as best you can – you will end up with two K/P sts next to each other, but that fine, in the next increase/decrease you will be back to K1P1 the whole way round. For the tentacles, you work each tentacle flat and then cut the yarn at the end and leave sts on a spare needle to be used for the bottom edge of the hat. For these tentacles, you work each tentacle flat and then BO the yarn at the end. 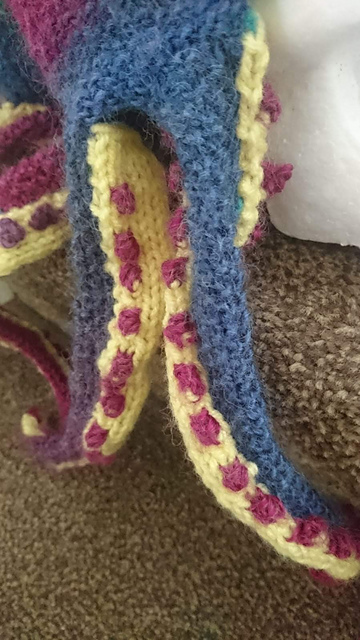 You can chose to knit these pieces separate to the main colour tentacles and sew them together at the end, as I have, or work the two pieces together using intersia to change colours. Up to you guys! CO3sts in contrast colour, work in stockinette stitch (K row followed by P row) starting with a K row. In main colour, CO 39sts, working in seed stitch, work across the 8 sts on each of the 8 tentacles (64sts) that were left on the spare needle. Join in the round, careful not to twist sts. 103sts. Work in seed stitch until work measures 5cm from the CO edge. Decrease 2 sts evenly across hat (I decreased sts 1&2, 52&53) to give 101 sts. Work 1 rows seed stitch. In main colour, CO 71sts, join in the round careful not to twist sts. 40-41 – Work in seed stitch. 43 – Work in seed stitch. 45 – Work in seed stitch. In contrast colour, CO3 sts and divide across 3 dpns, work in the round. In main colour, CO12sts and work flat. 1-10 – work in seed stitch. Sew tentacle bottom sides underneath the tentacle top sides (see photo), making sure to pull thread tight to encourage the tentacles to curl. Sew octopus body onto the back of the hat, I lined up the CO edge of the body at the start of the decreases, then pulled and tacked a few of the body sts onto the top of the crown to emphasise the bulb like shape. Stuff very lightly, again to emphasis it’s shape. Attach eyeballs to hat (use photo as a guide) then partially cover these with the eyelids (again see photo).